Which detail supports the idea that the Nile no longer floods? It always had water for irrigation. Monsoon rains fall and the river swells. The muddy river delivered nutrient-rich soil. The Aswan Dam was built. Use context clues from the text to determine the meaning of malachite. What form of figurative language does the sentence below contain? The deserts offered only bare rock and sand. Egypt is the Gift of the Nile. The volcanic rocks are as black as ebony. The fierce expanses of desert acted as guardians, deterring invaders. Using context clues, what is the meaning of the following word. 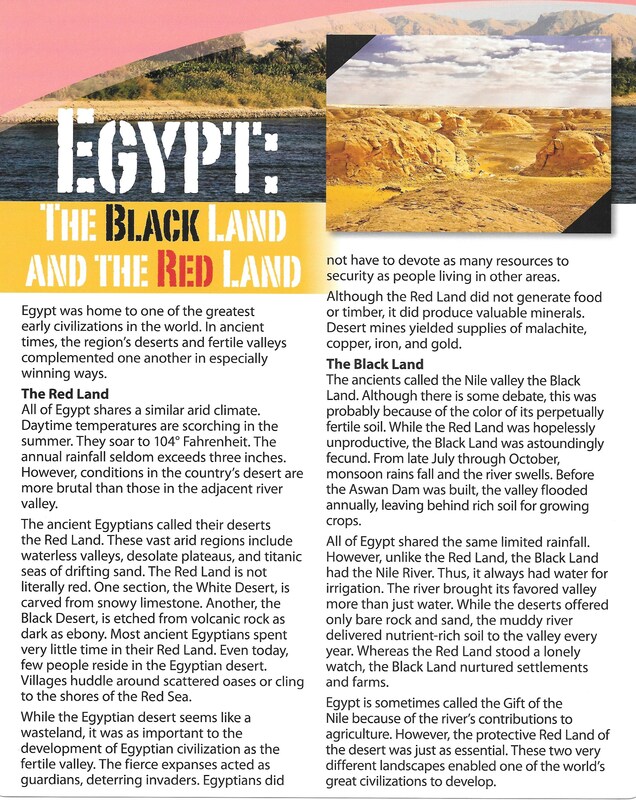 Which would be a better place to live, the Black Land or the Red Land? Using details from the text, write a paragraph in RACES format to express and defend your opinion.